Very little (do I) know about ‘class Aves’ (not that I know other things well)…. Of course they are treat to watch… and they move from one place to another – bird migration is the regular seasonal movement - and factually they lose out in migrating – perhaps they might lose out more if they do not migrate is a paradox. The Arctic Tern holds the long-distance migration record for birds, travelling between Arctic breeding grounds and the Antarctic each year. Siberian migrant birds sporadically visit India ~ Vedanthangal in Chingleput is famous for the winged visitors from various parts fo the World. Curiously the name would translate to ‘hamlet of the hunter’ ! Ducks, Cranes, Pelicans and more….. or simply … white birds, ducks, the ones with blue tinge…. One need not be an expert – still one can enjoy the winged visitors for sure….. for those used to concrete jungles missing even the common sparrow, these birds are quite enrapturing. Wetlands are the most important of life-supporting ecosystems that have sustained human lives and communities over the millennia. Vedanthangal birds sanctuary is one of the smallest and oldest in the country with a unique history. The local people have been protecting the sanctuary for centuries now because they have realized that the bird droppings falling into the tank increases nitrogen content of the water and when used to irrigate crop increases the yield greatly and saves the cost of fertilizers. As far back as 1798, the village folk convinced the authorities to give protection to the birds of the 30 ha. area of the Vedanthangal tank. Around 30000 birds come every season even though the area is just 30 ha…… the lake attracts multitudes of herons, egrets, storks, ibises and spoon bills. Vedanthangal Bird Sanctuary is a 30-hectare (74-acre) protected area located in the Kancheepuram District around 75 kilometres (47 mi) from Chennai on National Highway 45 (NH45), south of Chengalpattu. From Chingleput, Patalam, famous Sri Prasanna Venkatesa Perumal temple, Thirumalai Vaiyavoor – it leads there. When Chennai and its neighbourhood was devastated by floods in Chennai, it did some good to the bird sanctuary. It brimmed with life and sound of migratory birds which come every year for nesting and breeding. For the last two years, poor monsoon played spoilsport for birds which could not nest and breed properly in the sanctuary. Copious rainfall wooed more winged visitors and humans too followed – those who came were thrilled by the sight of painted storks, open-billed storks, cormorants, night herons and cattle egrets, besides black and glossy ibises frolicking in the water bodies full of fish or relaxing on trees. Generally, the migratory birds being leaving by end-February or early March and by the end of the month just 100-200 birds, most of them painted storks which usually arrive late, remain; but this time, it reported that nearly 82,000 birds have been counted and are almost reluctant to leave, say officials. The extend stay of the birds this time, officials claim is due to the work put in by the forest department last year. Even before the monsoon began in November, they deepened the pond and desilted the five channels, released tens of thousands of fingerlings. They also removed from the tanks cat fish, a predatory species that usually feeds on other smaller fish and brings down their population. Here are some photos taken by me during a visit in Dec 2015.
it took 23 years to end - impersonation in Govt job !! A couple of decades ago, have seen people impersonate and write examinations [especially Arrears] for their friends .. .. .. a classmate of mine once sold his Typewriting (lower) Original for a pittance to another friend [having the same name] – that person somehow could not pass TW and after a few failed attempts, bought the Certificate of his namesake, submitted the original and got a job – the lender had by that time passed Higher in style and did not require the lower certificate. !! Remember the blockbuster ‘ 3 Idiots / Nanban / Snehithudu’, a film that distinctively featured inventions ingenuously made. When the two friends try finding out the other colleague who was so innovative in their college, comes the turn that a rich Estate owner had in fact utilized their servant to study in guise and his son taking the credits. Impersonations are nothing new in Cinema. Way back in 1980 came the Rajnikant blockbuster ‘Billa’ – storyline featuring a mafia don, who gets fatally wounded in an encounter. The police plant a decoy, a villager impersonating the don and providing vital clues ~ [though the film ran for many days, I always feel, that naming of the movie after a cruel criminal was in bad taste]. The film Kathi was about Jeevanandam, a social activist fighting a MNC - a small time thief swaps position bringing about some good results. In ‘Naan’ – an young student is caught forging the signature for a friend, the events take an ugly turn, making him turn a killer. On release, with none to fall back, he decides to go to Chennai in pursuit of a life – the bus meets with an accident – he picks up the certificate of a fellow passenger, joins medical college by changing his identity. Well this is no cinema review – but an interesting story of impersonation, portrayed in different perspective by 2 news papers. Indian Express, Chennai edition reported that – after 20 years of legal battle to claim her right to employment which was fraudulently taken away by an impersonator, R Parvathi finally got justice. Parvathi, who had registered with the employment exchange at Thudiyalur in Coimbatore, was called for an interview for a vacancy of Class IV employee in Pollachi. After attending the interview, Pravathi thought she had not been selected and went to the exchange to renew her employment card. However, officials said that she had already been appointed in the Pollachi Commissioner’s office. Smelling something fishy, she found out that Pollachi councillor’s wife has impersonated her and got the job which was due to her. Parvathi began knocking at the doors of justice in 1996 by filing original application. It was only in 2009 that Parvathi’s application was taken as writ petition and the Madras High Court ruled in her favour after finding that the impersonator, who goes by the name Parvathi, changed her father’s name to get the job which was due to the other Parvathi. Not only that, there were several anomalies in service register, including that of overwriting the initial. But then her misery did not end and the impersonator filed an appeal in 2012. It was only in 2016 that she got relief when Justice S Vaidyanathan ordered to provide suitable employment to R Parvathi. Judge Vaidyanathan also ordered the municipality to recover the amount from the impersonator as she cannot claim wages on such an alleged act. “The case requires a proper investigation by law enforcement agency to book the culprits who were responsible and involved in the acts of creating records and altering data, thereby abetting impersonation,” Judge Vaidyanathan added. Times of India reported the same story, more from the imposter angle. It took 23 years and two judicial orders for state agencies and the Pollachi municipality to end the fraudulent career of a woman who brazenly impersonated another with the same name, bagged her job in the municipality , changed her father's name, date of birth and educational qualifications. Now that Parvathi's game is up, the Madras high court recently upheld a single judge order to discontinue her `service' and recommended criminal action against the authorities for failure to take action against her. It also ordered the authorities to recover the salary that Parvathi received. Parvathi took up the post in Pollachi municipality in 1990, though another Parvathi, the daughter of Rangam, was senior to her phoney namesake in the employment exchange records and went through the selection process. The fraud came to light in 1993, when the real Parvathi went to employment exchange to renew her seniority. Parvathi was informed that she was already working in the municipality. She then found that a woman was impersonating her in the office. On being informed that the process could not done because she was already working in the municipality , she checked and found that a woman was impersonating her in the office. She lodged a complaint with officials but, when they failed to take action, she filed a writ petition in the high court. In his order, the single judge said that though her age was beyond the eligible limit for the Class IV job -which is between 18 and 30 years -the authorities allowed her to take up the post without any evidence. They accepted as proof a mere declaration and medical certificate. She managed to get the date of birth mentioned in the service register erased and altered to show that she was born in 1960 and had her educational qualifications changed to show that she was literate. Her father's name was noted as “Rengan“ when in the sponsorship letter of the employment exchange, of 1990 had the fraudulent candidate's husband's name, Palanisamy . “Therefore, there is absolutely no possibility to say that the entries have been inadvertently made in the service register. This court is of the view that Parvathi had impersonated the real Parvathi, and [she is] not entitled to continue in service,“ he said. Section 416 in The Indian Penal Code : Cheating by personation.—A person is said to “cheat by personation” if he cheats by pretending to be some other person, or by knowingly substituting one person for another, or representing that he or any other person is a person other than he or such other person really is. According to Sec 419 : Punishment for cheating by personation.—Whoever cheats by personation shall be punished with imprisonment of either description for a term which may extend to three years, or with fine, or with both. ARVC pushes James Taylor to go Beau Casson's way !!! Today at Bangalore, RCB blazed all guns – the 19th over peaked – it was not Chris Gayle, DeVilliers, Virat Kohli or Shane Watson, but the diminutive Sarfraz Naushad Khan – RCB were 186/4 … the 1st ball of Bhuvaneskumar to Kedar Jadhav – a no ball, a beamer, hit over backward point for 4; 2nd – 1 run; 18.2 – Sarfraz played a scoop over short fineleg for 4; 18.3 Sarfraz bends connects another scoop for 4; 18.4 – low full toss, Sarfraz opened the face of the bat and steered it over 3rd man for 6; 5th another scoop for 4 and 6th hit over extra cover for 4 – 28 runs of Bhuvi over !!! In Sept 2015, England beat Australia by 93 runs in ODI no. 3682 at Old Trafford, Manchester – a short stylish JWA Taylor was the man of the match for his century. There is a popular belief that ‘every train to Madras Egmore brings along at least half a dozen of girls from rural villages, aspiring to become heroines’ – and out of tens of thousands, only a handful end up getting their face shown on the screen. Equally true in Cricket also – after School / College or University level (or sometimes without this graduation); League level entry itself is tough, tougher is playing for the State, then for the Zone, then for the Nation. Many of them would like to play for IPL franchisee rather than the State also could be truth. – and what is success ? In Apr 2012, I had posted the sad story of a young aspirant who retired from all forms of Cricket at the age of 28. A story of a man whose career began at the age of 20, rose to heights and at 29 could never again deliver more than the occasional ball in the nets as a coaching aid. He played 53 first-class games and had the honour of playing One Test that too against the West Indies in 2008 – it is the story of Beau Casson. He enjoyed success, took 123 first class wickets and in 2007-08 claimed 29 wickets in nine games to finish as NSW's second highest wicket-taker in a triumphant Pura Cup campaign. In his debut Test, which turned out to be the only one, he took 3 wickets. You may not have read or heard of ‘Tetralogy of Fallot’ - Casson was afflicted by this which required surgery at a very young age. The condition worsened in 2012 and, according to his doctors, it could turn life threatening if he continues to play. In October, Casson had to leave a Sheffield Shield match between NSW and South Australia at the Adelaide Oval after a recurrence of the problem. Cricket NSW Chief Executive rightly said "Beau's decision to retire is very sad news, however, his health is all that matters. Tetralogy of Fallot (TOF) is a congenital heart defect which results in low oxygenation of blood due to the mixing of oxygenated and deoxygenated blood in the left ventricle via the VSD and preferential flow of the mixed blood from both ventricles through the aorta because of the obstruction to flow through the pulmonary valve. Life is cruel to some and quite unfortunately most of the fortunate people do not understand the value of the fortune that they have been endowed with and end up smirking at smaller issues. 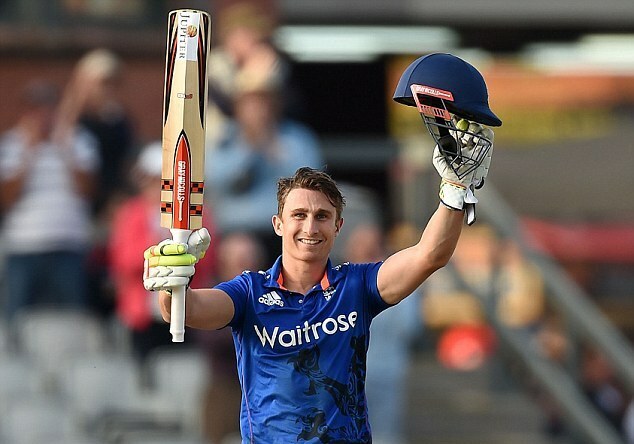 Now that record is beaten - Cricket is reeling with the news that James Taylor, one of the most popular figures within the England set-up, forced to retire with immediate effect because of a serious heart condition. Taylor, 26, has been diagnosed with Arrhythmogenic Right Ventricular Arrhythmia, a similar condition to that suffered by footballer Farbrice Muamba, who collapsed while playing for Bolton against Spurs five years ago. It is a devastating blow for a batsman who had finally established himself in the England Test side and was a regular in limited-overs squads having battled for a regular place for four years and been a consistent run scorer with both Notts and the England Lions. Taylor was a diminutive but classy batsman who played both Test and one-day cricket for England. 'Safe to say this has been the toughest week of my life,' Taylor tweeted this morning. 'My world is upside down. But I'm here to stay and I'm battling on!' His message was completed with '#lifestooshort' and two emjois - one of a face with a tongue stuck out, and the other with a face with a thermometer in its mouth - a touch of upbeat humour in trying circumstances. In another similar message, this time posted on Instagram, he shared a picture of himself lying on a hospital bed, with electrocardiogram sensors attached to his torso. This message was signed off '#WhenLifeGivesYouLemons'. Arrhythmogenic Right Ventricular Arrhythmia (ARVC) is a rare disease of the heart muscle, and an inherited condition. It affects around one in 5,000 of the population and accounts for a significant proportion of deaths by sudden cardiac arrest in the young. Symptoms are often brought on by physical exertion. The disease causes changes to the heart muscle cells, which then affect the electrical signals passed through the heart, causing irregular heart beats. The condition is progressive, meaning it gets worse over time unless treated. Taylor is known as one of the most hard-working and fittest members of the England team and regularly scored highly in the bleep tests that monitored the fitness of the England team. The diminutive Taylor, who is 5 ft 6in tall and known universally in cricket as 'Titch', was batting for Notts in their early season match against Cambridge University last week and when he was dismissed immediately headed to the nets before telling the team physio that something did not feel quite right. The full severity of the condition has been revealed to Taylor and his family in the last week and he has spent the last few days in hospital before he was told there was no option but to retire and concentrate on the operation which will hopefully let him lead a normal life. Sad and cruel quirk of fate for this key member of the side that won in South Africa this winter, particularly excelling in the field at short leg, where he said he wanted to become the best in the world in that position. For one used to visiting divyadesams and other important temples of Madras, the temples of Kerala are different – different in architecture, religious practices and more .. and you see so many big temple elephants. The Madras-Quilon line was extended to the capital of the Princely State of Travancore and this station existed in 1918 when the Quilon - Trivandrum Central Metre Gauge Line was inaugurate. This place was known for coconut oil, oil cake and coir industry – goods were transported by rail, boats (vallams) – reportedly German and British bought Paravur made coir ropes for World War I- World War II. Paravur is a municipality in the Kollam district of Kerala. The lakes and sea coast of Paravur attract visitors and foreigners with the main attraction the interconnection of Paravur Kayal (lake) and the Arabian Sea. There is famous ‘Puttingal Temple’ (Goddess on an ant hill – puttu in Malayalam for anthill!). the annual festival is much attended event with fireworks (Matsara Kambam) and other events associated with the festival (Aswathi vilakku, Kathakali, Kampadikali, Marameduppu) taking place grandly. .. .. this is no religious post, sadly, hundreds of lives have been lost in a fire accident ! it was of such a magnitude that hours after a massive fire broke out at the temple on Sunday 10.4.16 -- in which 106 people died and more than 350 were injured, Prime Minister Shri Narendra Modi reached the spot with a team of 15 doctors from Delhi. Chief Minister Oommen Chandy and state Home Minister Ramesh Chennithala took the Prime minister around the temple precincts and briefed him on the incident. Later, PM Modi visited the district hospital and met the injured. Sometimes it is better not to see the news or read papers after such tragedy. Kerala Police on Monday detained five people who were involved in conducting the firework display after a huge fire broke – sure there would be more blame game. Poor safety planning and lack of governmental accountability is nothing new, yet the tragedy in the Puttingal Devi temple is a complete shocker. The death of more than a hundred people and injuries caused to scores by explosions in a storehouse, was a result of gross negligence, a combination of appalling carelessness and a reckless disregard for the safety of others. That the deadly blaze was triggered by a display of fireworks that were set off despite permission having been refused by the District Collector raises serious questions about the actions of the organisers. What is equally surprising is the failure of the police to implement the decision of the district administration, writes one newspaper and you know who ? Political parties will not refrain from trying to extract electoral capital from the tragedy in poll-bound Kerala — it is important that the truth is not crowded out by the noise. A case has already been registered against the temple committee and the contractors hired for the fireworks; at the same time, the Kerala government has ordered a judicial inquiry ! Away from the melancholy, here is some insurance angle read in Indian Express, Chennai edition. A fire insurance of a meagre `1 crore and a public liability insurance of `5 lakh for two days, was all that the Puttingal temple administration in Kollam, took, where more than 112 people were killed in the fire cracker tragedy in the wee hours of Sunday. 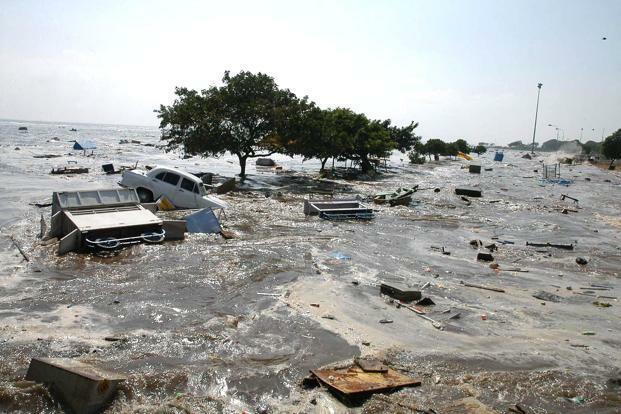 More than 350 people were injured and 500 houses destroyed at Puttingal tragedy. 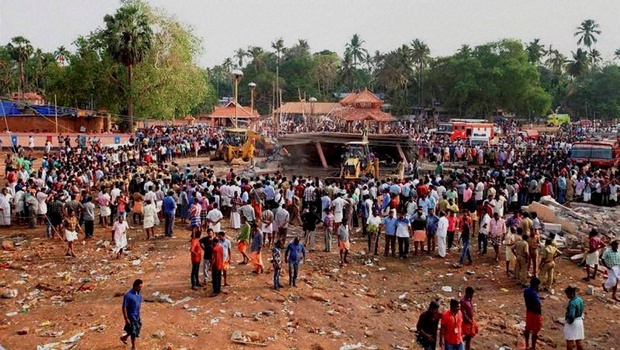 The amount spent for the fire display at temple is estimated to be `10 lakh. The amount spent to buy the insurance cover is about `50,000. The policy taken by the temple from the Kollam office of New India Assurance Company is insufficient to cover even the damages. Further, since firecrackers were stored without permission, claim settlement could get delayed ! “The victims can make claims from three sources. First from the temple authority, secondly if anyone files a PIL in the court and third compensation declared by the state,” said Delhi based insurance expert Vipul Soota, co-founder of Learning Enablers, an insurance education portal. Many of the 105 major and small temples in Kerala are not insured or under-insured during the festival days. Thiruvananthapuram has 27 major temples and Alappuzha 15. “Generally these occasions are gravely under-insured,” said Viswanathan Odatt, Managing Director, Aims Insurance Broking Private Ltd.
Often fire display in temple festivals in Kerala are conducted with no insurance cover or for pittance. “The insurance is taken, with a limited view—to get the approval for conducting fire display from the authorities,” said a senior executive of New India Assurance Company. “The amount is too small when compared to the damages and loss of life. The only hope is the ‘waiver’ clause in the case of the insurance policy which allows the insurance company to decide whether to give the insurance amount or not,” said Ramachandran Nair, Administrative Officer, New India Assurance Company. “Taking fire and public liability insurance for temple festivals and church feasts in the state should be made mandatory and properly insured,” says Sushil Kumar, an LIC agent who has worked in the region for more than two decades, adding the people here have more than one life policy. I never knew that these are being insured – whether your Company would be willing to cover this, after reading accidents like this, is well known ! … a day after the temple tragedy, in which the death toll rose to 109, three cars laden with explosives were seized by the police about 500 metres away from the Puttingal Devi temple adds a new conspiracy angle. City Police Commissioner P. Prakash is quoted as saying that the cars, found parked near the temple, came to the notice of the local people late on Sunday. They alerted the police. On Monday morning, the police cordoned off the area and examined the cars, which were found packed with explosives, some of which were of high intensity. Since the State police did not have the expertise to defuse them, the task was assigned to experts of the Petroleum and Explosives Safety Organisation camping at Paravur for the investigation into Sunday’s explosions. Mr. Prakash said two of the cars carried Kollam registration numbers and one Thiruvananthapuram. Their ownership was being verified with the Transport Department. Makes a sad reading indeed ! Maharashtra facing acute water crisis - should IPL be played in Maha !! After Asia Cup and ICC T20 WC – Cricket fans will be treated more .. though Chennai fans who had all along whistled and painted town yellow would be finding it difficult as in July 2015, the RM Lodha committee suspended the owners of the Chennai Super Kings and Rajasthan Royals franchises for a period of two years on charges of spot-fixing and betting during the 2013 IPL season. The 2016 season of the Indian Premier League, abbreviated as IPL 9 or Vivo IPL 2016, will be the ninth season of the IPL, held between 9 April and 29 May 2016. The season will have two new franchises, the Gujarat Lions and Rising Pune Supergiants based in the cities of Rajkot and Pune respectively. In all there will be 60 matches played, including 56 Group Stage Matches and 4 Play-off Matches. The 2016 season will be the first IPL season to use LED stumps. 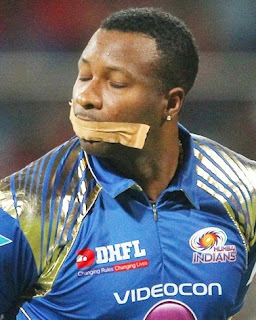 All people, especially bloggers would be busy… remember the earlier South Africa session of IPL 2009 – when fake IPL player drew everyone’s attention. People relished the blog which gave unflattering nicknames to players, coaches, and owners of KKR and other teams, telling sordid stories, and showing most of them in a very negative light. For long it was believed to be of a fringe KKR player who was upset at not being part of the core team. In that 2009 IPL season took place in South Africa, two KKR players, Aakash Chopra and Sanjay Bangar, were sent home to India midway through the tournament. Its middle name perhaps is controversy – prior to CSK and RR, there was a franchise from Kochi, Tuskers that was banned after a brief existence. In a final at Wankhede, bollywood actor Shah Rukh Khan was embroiled in an altercation with a security guard and was banned from entering the stadium. In 2010, our own Sir Jadeja was found to have violated the IPL code of conduct by seeking to secure a better contract with other teams in the league. The IPL handed Jadeja a one-year ban for his act of indiscipline and for breaking the player trading rules. The next year a player, Luke Pomersbach chased and allegedly molested a young woman and was arrested by Delhi Police. Indian leg-spinner Rahul Sharma and South African fast bowler Wayne Parnell were arrested by the Mumbai police after being caught at a rave party in Juhu. The biggest of them all – the man who created, administered and made rich the coffers of BCCI, Lalit Modi was dismissed by the Board in 2010, after IPL 3 for financial irregularities. There was the spot-fixing controversy too. For many years, I have firmly believed that IPL in floodlights was blunder and against common man, especially at times, when Chennai and other parts of the State and Country were facing severe power crisis. Now here is another ethic-centric controversy. The opening match of IPL 2016 will be played in Mumbai on April 9 as scheduled after the Bombay High Court adjourned a matter related to the hosting of matches in the drought-hit state of Maharashtra. While hearing a Public Interest Litigation on Wednesday and Thursday, the High Court had sought an explanation from the BCCI and the three state associations on why water should be "wasted" on IPL matches in Mumbai, Pune and Nagpur following a severe state-wide drought in recent months. The matter will next be heard on April 12 – and match will be held meantime !! While the division bench, comprising Justices VM Kanade and MS Karnik, has not yet passed an order, it reportedly asked the Maharashtra government and Mumbai's civic body, the Brihanmumbai Municipal Corporation, to file replies outlining plans to address the issue of water shortage in the state. The court has also asked for a report on how the water suppliers for organisations like the BCCI are getting water from. Crifinfo reports that the Advocate General's office, appearing on behalf of the state, contended that 21,000 litres of water were sanctioned to the Wankhede Stadium for use per day, 0.00058% of the water utilised by city of Mumbai. "We don't care about a tournament like the IPL. Their interests are purely commercial and to mint money," the court said on Thursday. "But just because they can pay for water tankers providing water at a premium rate, while others can't afford it, means there is a problem that the state has failed to identify and address. "The state authorities must, therefore, find out where the BCCI's water suppliers get their water from. That is not the BCCI's prerogative, it is the State's." While the court stressed on the accountability of civic agencies, it also criticised the arguments made by the BCCI counsel in response to the PIL filed by Loksatta Movement, a Hyderabad-based NGO, which had demanded relocation of IPL matches from Maharashtra. The board's senior counsel, Rafique Dada, said that less water was used at the grounds during the IPL in comparison to preparations for an international match. "For international matches, there is a requirement for pitches to be watered 48 hours prior to the match, but for IPL matches, it is just watered twice a day on the day of the match." Dada submitted. "Therefore, if taken to its logical conclusion, there is less water used during the IPL than otherwise." Dada added that apart from watering pitches, the remaining usage of water was "routine" by the standards of "all international stadia for its day-to-day maintenance". He also argued that prohibiting such day-to-day maintenance would lead pitches and grounds of international standards to "die a natural death". In response, Justice Kanade observed: "We were expecting you (the board) to show some consideration or at least submit that you will consider using the water for the tournament responsibly. But here you are almost suggesting that grounds and pitches are more important than people who are dying without water in the state." Arshil Shah, who represented the petitioners, insisted the court pass an interim order to stop the IPL matches in Maharashtra until the report from the state and civic agencies is submitted. The court rejected the suggestion. "Let the report be submitted, if it shows that moving the matches out of the state will help address the water drought situation, then we shall consider," the bench said. Overall Maharashtra is scheduled to host 20 matches in the ninth edition of the IPL. Wankhede Stadium in Mumbai will host eight matches, including the tournament opener on April 9 and the final on May 29. Nine matches have been allotted to the Maharashtra Cricket Association stadium in Pune, including the Eliminator on May 25 and Qualifier 2 on May 27, while three matches will be played at the Vidarbha Cricket Association Stadium in Nagpur, designated as home games for Kings XI Punjab. BCCI officials refused to comment after the case was adjourned. At a sponsor event on Tuesday, however, IPL chairman Rajeev Shukla had ruled out moving matches out of Maharashtra. "We are with the farmers of Maharashtra, and will look to help them in all possible ways. If the Maharashtra government brings a proposal (in this regard), then the BCCI president, all of us, will think in what way we can help the farmers," Shukla said. "And I, through my MPLAD [Members of Parliament Local Area Development] fund, am going to personally adopt some villages in Marathwada [one of the regions hit hardest by the drought]. He is quoted as saying - Sport is a different thing, it needs little water. Farmers need huge amount of water. All political parties should come together to deal with this crisis." BCCI secretary Anurag Thakur said that shifting matches at the last minute was not easy and could result in financial losses. Water, electricity, people transportation – what, it is revenue that is always important ! The Maharashtra government has declared drought in 12,000 villages across Vidarbha. The decision will help farmers growing cotton, paddy and soyabean across the region, who were not eligible for the special drought package as per the National Disaster Relief Fund (NDRF) guidelines. Of the total 12,000 villages, nearly 5,900 come under Amravati division. In its efforts to raise more funds for tackling drought in the state, Maharashtra government has decided to levy a surcharge of Rs 2 on petrol and diesel while VAT on liquor, cigarettes and beverages have also been raised by 5 per cent. The surcharge on Value Added Tax (VAT) for gold and diamond jewellery will be 1.20 per cent. This is to tide over the crisis. As many as 1,109 farmers in Maharashtra’s water-stressed Marathwada region of eight districts ended their life in 2015, according to this Indian Express report. Rainfall over the last two years in three of the worst-affected districts was comparable to the lowest in the 20th century. Nine of India’s 29 states–Uttar Pradesh, Maharashtra, Bihar, Chhattisgarh, Madhya Pradesh, Karnataka, Telangana, Odisha and West Bengal–declared a drought in 2015,seeking as much as Rs 20,000 crore in Central aid. The Centre has given Maharashtra the highest agricultural aid: Rs 3049 crore. 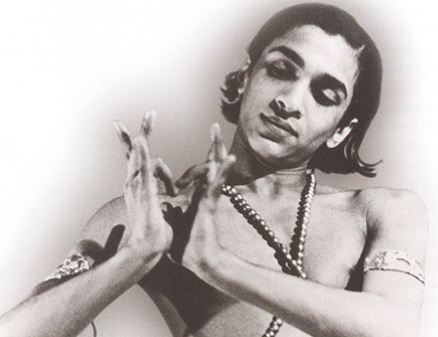 Can you identify this famous dancer…. In 1966, the famous Beatles, George Harrison befriended him and began to take lessons from him. This association catapulted him to international fame. The Beatles’ guitarist then went to India for six weeks. Here is something extracted from his website. ….. the "talas" or "rhythmic cycles" of a raga have unique intricacy and rhythmic sophistication in Indian music. There are talas ranging from a 3 beat cycle to 108 beats within a cycle! The most popular talas are those which have 5,6,7,8,10,12,14, and 16 beats to a cycle. Indian classical music is principally based on melody and rhythm, not on harmony, counterpoint, chords, modulation and the other basics of Western classical music. The system of Indian music known as Raga Sangeet can be traced back nearly two thousand years to its origin in the Vedic hymns of the Hindu temples, the fundamental source of all Indian music. Thus, as in Western music, the roots of Indian classical music are religious. To us, music can be a spiritual discipline on the path to self-realisation, for we follow the traditional teaching that sound is God - Nada Brahma: By this process individual consciousness can be elevated to a realm of awareness where the revelation of the true meaning of the universe - its eternal and unchanging essence - can be joyfully experienced. Our ragas are the vehicles by which this essence can be perceived. The performing arts in India - music, dance,drama, and poetry - are based on the concept of Nava Rasa , or the "nine sentiments. Each raga is principally dominated by one of these nine rasas, although the performer can also bring out other emotions in a less prominent way. The more closely the notes of a raga conform to the expression of one single idea or emotion, the more overwhelming the effect of the raga. This instrument to people like us is associated with him. It is the ‘Sitar’, a plucked stringed instrument used mainly in Hindustani music and Indian classical music. The instrument is believed to have been derived from the veena, an ancient Indian instrument, which was modified by a Mughal court musician to conform with the tastes of his Mughal patrons and named after a Persian instrument called the setar (meaning three strings). Used widely throughout the Indian subcontinent, the sitar became popularly known in the wider world through the works of Ravi Shankar, beginning in the late 1950s and early 1960s. Pandit Ravi Shankar, was the virtuoso sitar maestro who introduced Indian classical music to the world and inspired the Sixties 'psychedelic' sound through his collaboration with the Beatles. Shankar was born Robindro Shaunkor Chowdhury in Benares (a.k.a. Varanasi, or Kashi), West Bengal, on April 7 1920. His mother a Bengali Brahmin and his father, Pandit Dr Shyam Shankar Chowdhury, a wealthy landowner and minister in a maharaja’s court, who left London to practise law. In October 1970 Shankar became chair of the department of Indian music of the California Institute of the Arts after previously teaching at the City College of New York, the University of California, Los Angeles, and being guest lecturer at other colleges and universities. He performed widely in many continents. 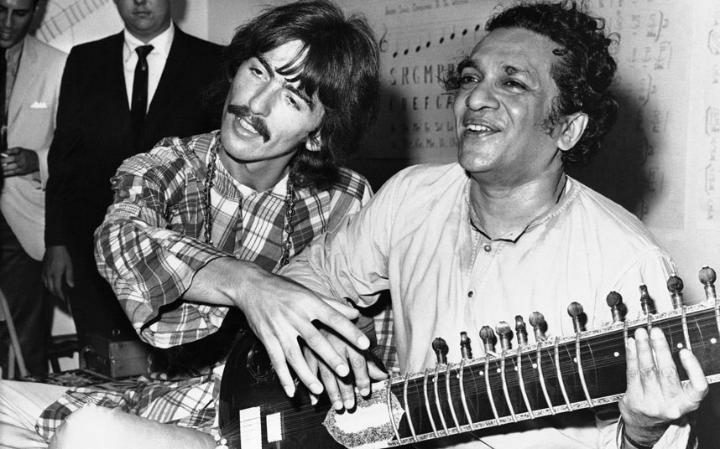 Ravi Shankar was nominated for an Academy Award for Best Original Music Score for his work on the 1982 movie Gandhi, but lost to John Williams' ET. He served as a member of the Rajya Sabha, from 1986 to 1992 after being nominated by Prime Minister Rajiv Gandhi. In July 2010, at the Southbank Centre's Royal Festival Hall, London, England, Anoushka Shankar, on sitar, performed with the London Philharmonic Orchestra, conducted by David Murphy what was billed the first Symphony by Ravi Shankar. Shankar's eldest daughter and protege Anoushka is now a respected sitarist in her own right. His other daughter, the jazz pianist and singer-songwriter Norah Jones. 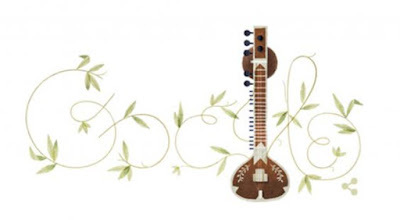 I am not for celebrating birthdays of persons who are no more … yet this Google doodle on his 96th birthday is quite attractive.